As a student, it can be tough to get time to read above and beyond your course materials. I mean, it can be a challenge just to read everything that your professors prescribe for you, much less anything for pleasure or your own self-directed education. But sometimes, you just have to explore a tangent that invites you, and you’re very glad you did. One tangent for me this semester was to dabble a bit into the concept and history of positioning. I wish I could remember what pushed me in that direction, or who recommended this book to me, because I would love to give them credit! 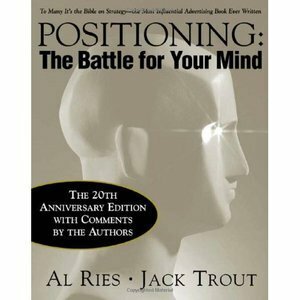 But I ended up reading the Al Ries and Jack Trout book Positioning: The Battle for Your Mind. In this straightforward and influential book from the early 1980s, the authors flesh out the concept of positioning, which they had begun to describe in the early 70s. Obviously there is a bit more to it, and you should read the book for some enlightening examples from the history of marketing and advertising (including a case study on the positioning of the Catholic Church), but the fundamentals are there in this quotation from the book. And isn’t that always the thing about brilliant concepts? They’re simple, but you could write a novel full of expostulations and corollaries. I will leave the expostulating for Ries and Trout to execute, and for you to read. But I will say this — positioning is closely linked to a brand’s “one thing” that we keep talking about in my services marketing class. And it’s about the psychology and communication behind how you promote that one thing. You have to know where your competitors are in the consumer’s mind — their market position — so that you can “look for a hole” and sail through it. I may be muddying the water already, inadvertently illustrating the genius and simplicity of the Ries and Trout book, so I highly recommend you get it straight from the horses’ mouths. There are some unexpected and funny lines, and the 2001 edition has delightful updates where they admit where they may have fallen short or gone too far. After all, the book first came out in 1981. But the lessons are just as important, and part of the joy of reading this book is to think for yourself what the implications are for social media, etc. Ries and Trout were already saying consumers were fatigued by too much communication then, before the communication stream became a river with the explosion of the internet. And now, social media has flooded the river’s banks. It’s a classic, so I am confident this is one of those books I will come back to in my career when I feel stuck or suspect I’m beginning to fall into orbit around the dreaded black hole of marketing myopia. Have you read this book? What books have you found that are indispensable for guidance in your profession or your career? Let’s talk in the comments below! Great post! Especially this line- sometimes, you just have to explore a tangent that invites you- perfectly written. I am so very lucky, working in educational publishing, that it is my JOB to read and learn. I feel ever fortunate that I get to not only read publications from the world’s top scholars, I actually get to MEET them and talk about their ideas in person! Nerd swoon!!! I do read a lot of business books- recently, Mack’s Think Like A Rock Star, have Andy’s Content Chemistry in the office, and of course my man Dan Pink has finally written a book about sales that I can be proud of. But the one non-fiction piece that had the greatest impact on me in recent years was Ratey’s Spark, about the science of exercise and the brain. Incredible impact on my day-to-day life. Science heavy, which I loved. Thank you! Your job really does sound incredibly awesome. Would love to hear more about how you came into it! You know, if you like science books, you might like Mary Roach. If you haven’t read any of her work, I can tell you it’s easy to read and she writes about kooky semi-taboo stuff like corpses and astronaut poop. Funny and interesting all at the same time! I’m in the middle of reading some David Ogilvy, so I think I will be doing a post on that soon! Get a little love in your inbox! This Stuff Only Happens to You, Scott!